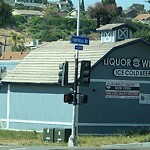 The Opticom receiver on the mast arm for northeast bound Cesar Chavez @ Logan Ave needs to be adjusted. Thank you. 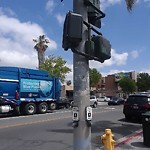 Can you turn that signal head more left because its not that visible due to construction in the way and fences too. At Broadway and 7th ave I think. 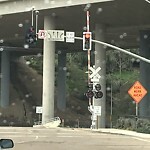 The PED signal head is facing to the right. 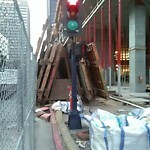 Its in a construction area. 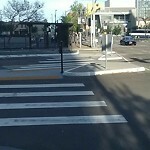 At 12th and Imperial ave, the PED signal at the end of the crosswalk in the picture is facing more at the traffic rather than pedestrians. Could you reposition it so the PEDs can see it better? A.Stop sign at Centre street and Lincoln is completely covered by a Bush! Many of my Lyft drivers have driven through this Stop sign because they could not see it! Left hand turn light on southbound hwy 101 at Enterprise st - entire light is turned to the right so the light signals are partially obstructed. 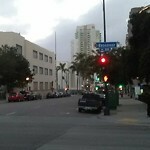 On Spectrum Center Blvd facing west, the signal light is turned a bit. This signal on the left gets turned to the side after every storm. It was fixed last week and is now facing the wrong way again.